Friday October 17 Unpleasant, raining by spells most of day, of course I didn't get out to see to things at home, but rest contented here with Mrs P_ & Estelle spent eve at games again. 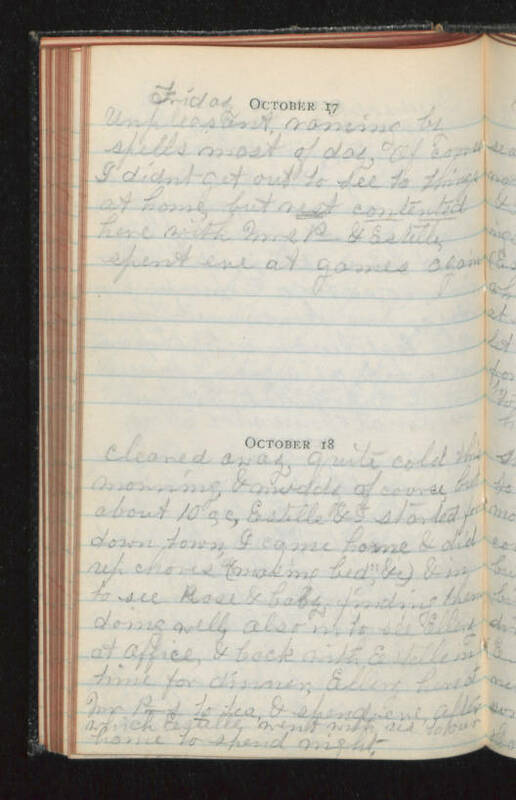 October 18 Cleared away, quite cold this morning, & muddy of course, but about 10 o,c, Estelle & I started for down town, I came home & did up chores ("making bed" &c) & in to see Rose & baby, finding them doing well, also in to see Ellery at office, & back with Estelle in time for dinner. Ellery here at Mr P_s to tea, & spending eve, after which Estelle went with us to our home to spend night.